On Thursday, October 25, 2018, CAS hosted its annual celebration of school leadership at Saint Clements Castle in Portland. The event was conceived eighteen years ago following a resolution by the CAS Board of Directors to find ways to recognize and pay tribute to individual school leaders as well as to promote the profession of school administration. More than one two hundred educators, friends, and family members packed the Waterford Ballroom at Saint Clements to join in honoring CAS’ 2018 Distinguished Administrators. Guests were greeted at the door with the stirring sounds of the Glastonbury High School Resident String Quartet directed by Nola Campbell. 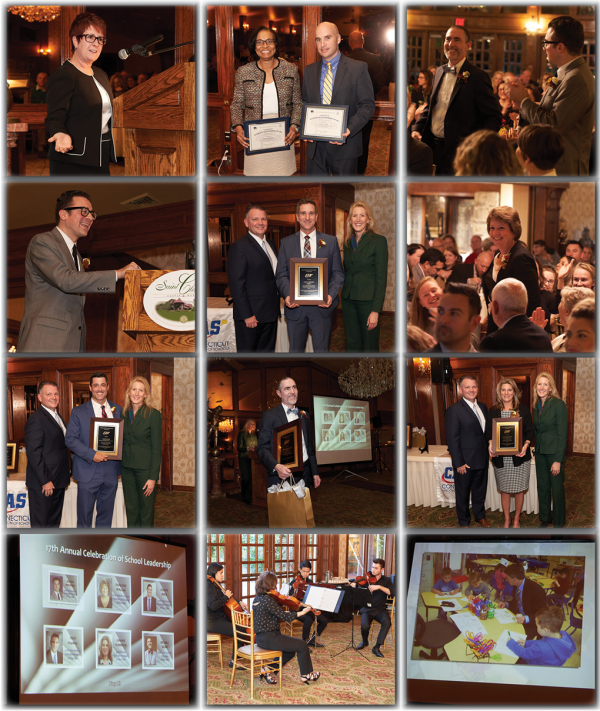 Donna Hayward, principal of Haddam-Killingworth High School and president of CAS, warmly welcomed guests and praised the accomplishments of the six honorees. “In the midst of declining resources, accountability pressures and the myriad demands of your profession, you continue to bring innovation, inspiration and dignity to the work of educating our children,” said Donna.